Beta Biothane makes your life EASIER. It looks and feels like pliable leather. It is very durable. It is easily adjustable with a hole punch and scissors. It's easy to clean. We sometimes just swish the tack in a bucket of water. Sometimes, we put it in the washing machine. 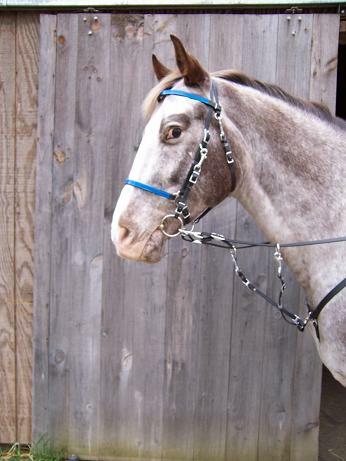 This style bridle has a halter with a ring on each cheek. Short adjustable/removable straps with a snap attach to each ring. Each short strap attaches to the bit. The bit is removed by unsnapping the straps from the halter ring. Changing from bridle to halter is quick and easy. Reins are not included with this item.